A delicious cooked chicken in a honey-garlic sauce. Best served with hot, steamed rice. 1. Place the chicken breasts in a bowl. 2. Sprinkle salt, garlic powder and pepper. 3. Toss well to combine. 4. Heat butter in a pressure pan. 5. Add the chicken and cook until browned and slightly crisp. 6. Pour the chicken stock and stir. 7. Combine the garlic, honey and soy sauce. 8. Add this to the pan and stir until the chicken is evenly coated. 9. Cover with a lid and pressure cook for 10 minutes. 10. Switch off the flame and allow the pressure to reduce. 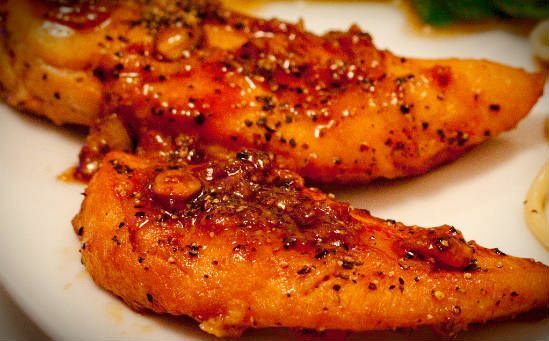 Feel free to comment or share your thoughts on this Honey Garlic Chicken Recipe from Awesome Cuisine. The rice will be raw or half cooked?? There will not be much of a water left. At step 13 and 14, you can sprinkle the leftover water on top if needed. The rice would have by now absorbed most of the water and will be wet. i didnt understand the 11th point Pressure cook till 3/4ths done and remove. Wudnt the cooker wil have water in it with the rice ? Please,give me a tasty vegetarian food. This chicken biriyani looks divine…made me drool! Excellent recipe. My wife made this at home and came out yummy. Please note step 10, the marinated chicken is added to the paste and cooked. Very Good and simple but tasty Chicken Biryani. Thanks Dominic. You can increase the quantity for 10 person. PLEASE GIVE ME RECIPE FOR 10 PERSON…. i love chicken biryani especially the smell it taste fabulous really delicious. I copied the recipe so that i will learn by myself to prepare so i can share to my loveones. nice recipe………but the language is difficult………..
Hi this dish is very yummy iam going to try this asap. marniate the chicken about five tablespoon onion paste and ginger garlic paste five tablespoons and curd eight tablesppoons and cashew and almond paste eight tablespoons pepper powder fivetablespoons . shortcut way… what about if it has to prepared in a large quantity?? lets say for 10 to 20 peoples???? where i could get that much big pressure cooker…. plz suggest. What I feel is 5 glasses of water is too much for 2 cups of rice.Wont the rice become too sticky. cool and best for beginners!!!!!!!!!!!! now i used to eat it more than my favourite dishes. fine few words should be expland in proper waay ,,becoz tey dnt underst wat dos tat means … simple fine,…. You cant have a flavourful biryani in a pressure cooker…. Wah so tasty chicken Biryani Recipe. I will give it a try to know its reall taste. wow its so easy method to prepare a chicken biryani……..
yes,the method is easy, and the biryani will have a good taste…. These recipe is very tasty and good. My wife made it well. This is a very good basic recipe. This is how its made in most homes where it is eaten on a daily basis. Only, its not baked in an oven, but the layers are arranged in a deep, preferably aluminium vessel, closed with a lid and sealed with wheat dough to prevent steam escaping. Cook for ten minutes. Its done. I had called in a professional cook to demonstrate a basic Biryani recipe to me once and this is exactly how she did it. You may add saffron soaked in a little milk, about half a glass and pour it on top when done and leave to absorb. this is very good for prople who do not have that patience to cook a dum biriyani..try it!!.. its very good for biriyani substitute..
r u really cook? i think, this is new invention of chicken biryani. this recipe is also good. i tried it myself. i think i will cook this recipe tonite for my pakistani husband . wish me luck. Thanks for such a wonderful & very easy chicken biryani recepy.just double the ingredients for8 to 10 peoples. I never feel that chicken biryani would be too easy which canbe prepared in a cooker..Not an ideal hyd biryani.. It is very tasty. in my house all.are liking very much. good i really like this recipe because it is very easy to prepared this recipe. I can`t get it…… Its not easy for freshers…. What a gorgeous Recipe! So rich, decadent and delicious!. Real yummy! it is really very good recipe . by reading only mouth is full of water. Not good for health.I lost my 400 rs after eating . This recepie is made for Rich people not for poor like me.so please remove this reccepe from site..
very bad. no layers of rice. I liked it very much, my better half cooked for me. I like only non-veg. items. I tasted it was very good. with due respect, you need to know the difference between biryani and chicken chawal.